It feels like I have been bitten by the holiday crafting bug and now I am in full holiday swing. 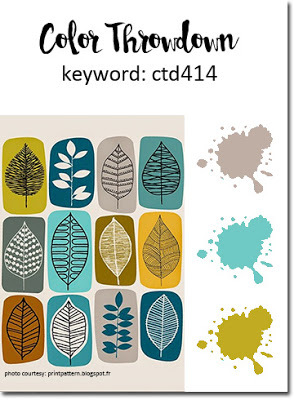 First up, a card using the beautiful colors at this week's Color Throwdown #414. I really like the delicate patterns in the newest What the Doodle by Papertrey--a set of ornaments. I stamped an entire card front, using my Misti to help with alignment, and then decided to only use the bottom half of my paper. I'm sure I'll use the rest some other time. I am also entering this card at Just Add Ink #333: Just add G (green ornaments). More of those ornaments on my next card--this time they are die cut, white embossed and sponged with Distress ink. 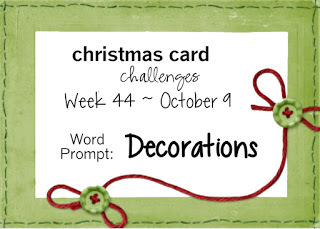 I am entering this card at Christmas Card Challenges #44: Decorations and Simon Says Wednesday Challenge: Totally Resistible. Last up is another snowy winter scene--perfect for Simon Says Monday Challenge: Explore the World. I am also entering this card at Merry Monday #217: Retro/Vintage. 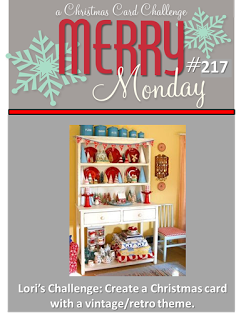 I used the same PTI Winter Village as I used in my earlier Merry Monday entry to create my vintage scene. Well, Joyce, you've officially convinced me that I need the What the Doodle Ornaments. I adore how you used them here! Such a lovely clean Christmas card Joyce. The colours are a lovely fresh combo. Thanks for sharing at Just Add Ink. Your cards are so beautiful, Joyce. I just love your first card; the delicate ornaments, and the design. Thanks for joining us at Just Add Ink this week! You are going to have your card list completed in no time, Joyce!! All very lovely! That first one is my favorite; love the non traditional colours! Enjoy the weekend! Thanks for sharing over at Christmas Card Challenges! Once again, a feast for the eyes! All so full of holiday joy. Love the vintage card with the house, and what a die cut bg! Wow. So striking with the colors you chose for the card. All wonderful, Joyce! So many great cards, Joyce! I love the ornament bg you created and then how you used them on your next card individually! Beautiful winter scene on your last card. You must be on a roll with your Christmas cards this year! Oh Joyce these are both fantastic...I love your winter scene, I have yet to ink it up, but you have inspired me...the background is awesome with the pop of red...perfect and I love the colors for your house! Thank you for bringing another card to us at Merry Monday! Beautiful cards!!!!!! Thanks so much for playing along with us at Merry Monday. Fabulous designs with the doodle ornaments, Joyce! Love both cards, especially the one with the large Peace! And your winter village card is beautiful, a perfect cozy scene! Clean and simple gorgeous! Thank you for playing along with us at CTD this week! I love how you played with the ornaments on both cards, Joyce! Fabulous sentiment on the first one, and great texture on the 2nd card...so festive, too! Once again, you've done an amazing job with this Village set...great vintage elements! What beautiful cards! Thanks for playing with us at the Color Throwdown! Wonderful Christmas cards, they are all fabulous. Another group of amazing cards my friend!! I just can't keep up with you and all the challenges that you participate in. Beautiful Christmas cards!